There is not much publicity and promotion on the Meepo – a sub $300, super affordable electric skateboard with 5-star riding experience. If you had heard about Meepo, it was either from Reddit or from Youtube. Because, those places are where Kieran, the man behind Meepo connects with fellow Eskaters. And those are the places where his customer raves about Meepo and how helpful Kieran has been when(if) they encounter problems on their Meepo. I’ve been offered an opportunity to interview Kieran, and I did. It has been a blast. So today, I’m honored to introduce you both Kieran and the Meepo Board! Kieran is a 28-year-old Chinese gentleman graduated from the field of mechanical engineering. A skateboarder and a longboarder, he was first introduced to electric skateboard through a TED talk delivered by none other than Sanjay Dastour from Boosted Board. So Kieran went and joined a major electric skateboard manufacturer and reseller in China. It was awesome, at least part of it was, for as a marketing manager, he gets to try out different electric skateboard from different brands. But there is a problem. The company is not making a profit. Kieran, the guy on the right. NOT the kid in blue. Don’t switcharoo me. The problem, according to Kieran, lies in the quality of the board. The way most Chinese manufacturers conduct their business is to push sales at all cost. Boards with quality issues were knowingly sold to customers. When those boards inevitably broke down, they were returned for refund and repair, which end up costing the company money. That’s why there was no profit. Kieran expressed his frustration to his boss, and guess what did his boss do? He blamed the losses on the sales team. Most Chinese electric skateboard manufacturers are not E-skaters, and their board’s performance annoyed Kieran when he was using them for his daily commute. In April 2017, with the ease of access to all the parts and manufacturers, Kieran started building a board for himself to use. He started from what he has and with some mix and matches, got a board that has the performance that he was satisfied with. He showcased the board on Youtube to try to get the attention from retailers hoping for some B2B business opportunity. Instead, what Kieran got was the interest of some viewers abroad.Some of the viewers expressed interest to buy the board, and after some back and forth, the first Kieran-made-electric skateboard was sold to a viewer from the US. Some of the viewers expressed interest to buy the board, and after some back and forth, the first Kieran-made-electric skateboard was sold to a viewer from the US. After proving that selling electric skateboard online can work, Kieran fired his boss and started his own electric skateboard company. And hence, Meepo was born. And yes, Meepo got its name from the DotA character with the same name. Today, Meepo is a 3 person company with Kieran manning the helm, making all the product decisions. The company is scrapping by, recording around 150 sales since its recent founding late June 2017. With no marketing budget, word-of-mouth has been the primary way Meepo found new owners – which is rather effective as the riding experience, board’s quality, and Kieran’s pre & post-sale services have left his customer raving about Meepo all over Reddit. In fact, that was how I got to know about Meepo too. When Kieran put together Meepo, the chief focus is the riding experience. Sure enough, the theme of ‘focusing on riding experience’ came out again and again when we talked about how he put together Meepo. “I think the Battery and the ESC are two of the most important component when putting together a board. When putting together the Meepo, the battery has been the one that gave me the most headache. ESC is simpler, I chose a good one and the rest is just making sure my firmware is up to date. “I have tried and change the battery I use for the board for around 6 times. People may say Samsung or LG battery cells is good. But using a good brand by itself isn’t enough. I have to get Samsung cells in model 22P to get the best performance. Kieran then went on to explain why he cares so much when picking the battery for Meepo. “When I was riding other electric skateboards in the market, there were a few problems that bugged me. For one, there was the issue where when braking with a full(or near full) battery, the board may turn off as the regenerative braking will be charging the battery over its max capacity. It manifests as ‘the remote disconnected’ but it was actually due to the battery’s BMS cutting off the charge. I have a stretch of downhill road in the beginning of my commute and I would be afraid every time going down it, frightened by the prospect that my board will power off. I don’t want to work around it by not charging the board fully. Neither do I want to skate around to drain some battery before I go downhill. 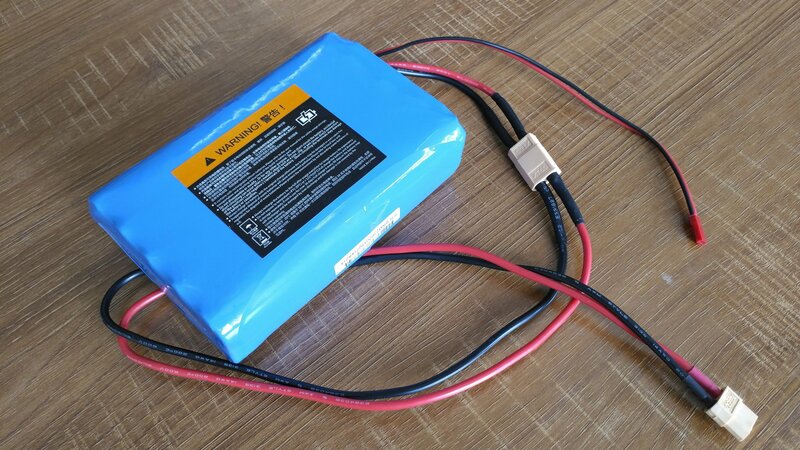 I want the problem solved and that’s what I did by working with the battery supplier. We worked together to tweak the BMS so that battery overcharging would not happen and the brake would not fail that easily. To my knowledge, some of the big players in the market still haven’t solved this issue. Another problem was when the battery was below 50%, some board will slow down ridiculously when going up a slope. That stinks and I’m sure my customer will not be happy if I sell them an Eskate that performs that way. Again, I don’t want this problem to plague my Meepo and after some back and forth with the battery supplier, we solved the issue. ESC is another component that was carefully picked for Meepo. “ESC impacts the riding experience significantly. A good ESC can allow the rider to control the acceleration – whether if they want it to be abrupt or to be gentle. ESC can get expensive, and there is really a point of diminishing returns where a pricier ESC does not improve the riding experience further, at least for Meepo. So to assemble an affordable board, Kieran picked out a good quality ESC that can that can give the best riding experience while staying on budget. “I would not say my ESC is the best, better VESC can cost up to $300 and that’s for a single motor! The ESC I use is a good one shared by many major brands. Look at it, it is beautiful, its has a symmetry look and has a simple design. It can do everything I want it to do, smooth acceleration, smooth braking, smart turn on, regenerative braking etc. Kieran told me that there was the concern that this motor looks bulky and unsightly, but at the end of the day, utility triumphs look, at least for Meepo. “I want a motor that does not have heating issues. Many China Boards use motors that will overheat to 90-100°C. That damages the motors. “I have been thrown off my board before, and it is not fun. With 70mm wheel, a small pebble can throw you off your board. With 90mm wheel, at least I can be confident that my wheels can safely roll over small bumps on road. As anything smaller than half of the radius of the wheel I can confidently roll over, a 90mm wheel can handle a 1-2cm bump easily. How about All Terrain wheels in the future? “I am adamant to get a two-pieces component housing at the front and tail of the board instead of a single full-length component housing at the center of the board. Meepo uses a 8 ply deck (7ply Chinese Maple + 1 ply bamboo Deck). Is Meepo’s deck the best? Kieran thinks that Boosted Board probably has the best deck on any E-skate right now, but his Meepo wasn’t half bad either. Hey, when you are making a sub $300 board, a compromise has to be made somewhere right? Meepo was built with good quality components. The early customer’s review reflected that. There were a few accounts of component failure, a great way to test Kieran’s after-sale service and he has passed them with flying colors. Another upside is how neat and tidy the component of the board was assembled. when we said Meepo is a good quality board, we didn’t mean that it has a refined look. 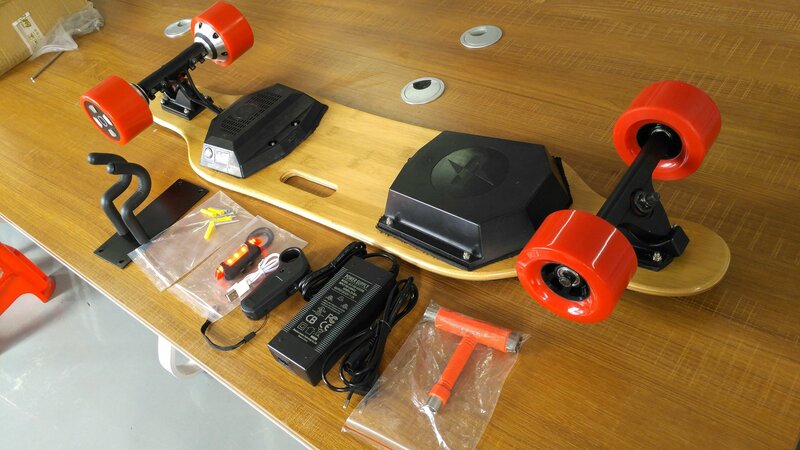 The board has is put together using components that are widely available in the Chinese electric skateboard market. The external designs are shared by many other Chinese electric skateboards that can be found all over Aliexpress. What Meepo differ is what lies inside and it reflects in how well the board performs. At the end of the day, the board has a DIY origin and definitely has a scrappy look. Let’s just say that there is more than what meets the eye. “E-skate is definitely the best portable vehicle among the likes of Segway, One wheel, and Hoverboards. In the future, Meepo will not deviate from its focus on quality and riding experience. Kieran wishes to add a third, more premium board to the Meepo line up once the company has a healthier bottom line. Something with an even better riding experience, more range and perhaps even better looking from the outside – but look still won’t be the priority, Kieran stated in a frank manner. At the immediate future, however, the goal is to get more sales. Kieran is hopeful as the word-of-mouth from his existing customers has beginning to help sales. But with a 3 person team, how well can Meepo be expected in handling massive orders? For now, Kieran is expected to handle all of the after-sale services. However, he is already in the process of bringing an extra person in to maintain the current top tier customer service. Kudos. I have yet to come across a negative review or complaint on Kieran and his Meepo boards. At a sub $300 price, there is nothing that can compare to it. The caveat is, Kieran was unable to get a better shipping deal from his shipping agent (monopoly) and hence the shipping fee for Meepo is ridiculously high. 100 USD to ship to the US! More than one-third of the price of Meepo itself! Bulk ordering would significantly reduce the shipping fee. So if anyone is interested in reselling or doing a mass drop for Meepo, well, let Kieran know. Kieran’s Meepo is still unmatched among the budget boards in both price and performance. Considering the electric skateboard in the budget segment: We have Acton Blink Lite(<400$), Torque Speedster(<600$), Yuneec E-go(<500$), Spectra Mini(<400$) and Lou 1.0(<500$). Meepo both out priced and out performs all of them even after taking account of the shipping fee. The after-sale service of Kieran is also unmatched by any boards on this list (other than DIYelectricskateboard’s Torque Speedster). To go any cheaper, you will be considering China Boards, which I have talked about extensively in my previous post. And no, I don’t consider Meepo as a China Board as it is not produced-en-masse (at least for the time being). But if you do consider Meepo as a China Board, just think of it as the best of what China Board can offer – Unbeatable price with great quality and service. Performance-wise, Meepo really does punch above its weight. A bubble chart for all board’s range and top speed. Click to enlarge. Click here to see the chart in Metric Unit instead. 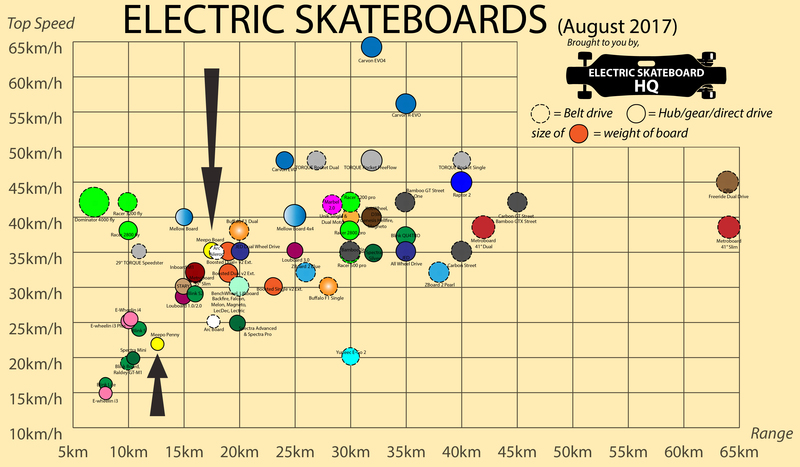 As you can see from the chart, Meepo is performing as well as the likes of Inboard M1, Boosted Dual and Blink S2. Boards that are easily 2-3x Meepo’s price. Meepo is the best budget electric skateboard currently available PERIOD. I will recommend Meepo as the first board to consider for anyone who is looking for a budget electric skateboard or a good electric skateboard in general, right before DIYelectricskateboard’s Torque Speedster. The philosophy of Meepo aligns perfectly with what I have set up to do with Electric Skateboard HQ. To promote electric skateboard as a mean of transportation for the masses. It is a commuting vehicle for the masses. And it is an easy recommendation for its price and its value. Not everyone can afford a Boosted Board but everyone can afford a Meepo. I talked to Kieran for 2 hours + and I like him. He is passionate about Eskate and clearly obsesses about putting together the best E-skate he can for the commoners like himself (and myself). I want to help Kieran out, so we made a deal. An exclusive deal for the readers of Eskate HQ. I help promote Kieran’s Meepo from now until the end of August, and in return, Kieran will give something back to my readers when they purchase a Meepo. From now until the end of August, Kieran will give you one extra adapter charger and one extra remote when you buy a Meepo long board. Just let him know I send you his way with the promo code “EskateHQ” on the check out page. *P.S. : This is not a paid review and that isn’t an affiliate deal. Update: Too bad the promotion has ended. But thanks to your support, the demand of Meepo has skyrocketed! Kieran now has to produce around 100 Meepo per day just to keep up with the demand! Kieran wishes to thank the readers of ElectricSkateboardHQ for your support. If you have any problem or question with the Meepo, you can reach Kieran at Kieran@meepoboard.com, or you could just leave a comment below and I will relay it to him. Even if you are not interested in buying a Meepo, I hope you enjoy this kind of content =). Leave a comment if there is another electric skateboard company that you think I should interview next.